Odaiba is well known as being a leisure area of Tokyo. Originally used as a way to protect Tokyo in the 1800s, it never found its true calling until the late 90s. Today, Odaiba is a hub of shopping and entertainment with various hotels and apartments located on several islands. 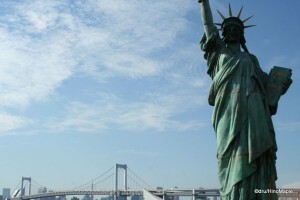 The main island of interest is Daiba itself. 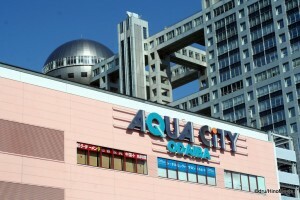 It is home to several shopping malls, a water amusement park, various futuristic exhibits, and Toyota’s main showroom. 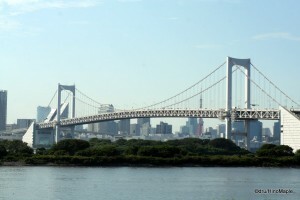 Going to Odaiba is one of the most expensive trips in Tokyo. The main mode of transport is the Yurikamome line. It’s an elevated train system that is very scenic and quiet, due to the use of rubber wheels instead of traditional steel train wheels. The trip over Rainbow Bridge, while using the lower deck, is quick and provides a very unique view of Tokyo and Odaiba as you enter and exit the bridge. The Rinkai line is also popular and cheap, but do note that it is all underground, so the view is not good. Also note that it is possible to walk across Rainbow Bridge, but you will be on the lower deck and completely sealed into the deck by a wire fence. It is probably very smoggy due to all the traffic. The first area people will see is one of the largest shopping malls in Tokyo. Running at over 500 metres in length, and several stories tall, there are three shopping malls located on the Northern waterfront. Often referred to as Decks, this shopping mall holds most of the value brands of Tokyo. It can feel very crowded and chaotic, especially on the weekends, so weekday shopping is advised. However, the views of Tokyo and a nice dinner with a view are worth the hassle of visiting this shopping complex. I’d recommend a stroll along the upper outdoor deck of the shopping complex to enjoy the views. There is a small indoor theme park, Joypolis, located in the centre of the complex where you can enjoy various small rides and games. The main attraction has to be the beach that is just across the street, the Statue of Liberty, and a nice scenic park where you can walk out to Rainbow Bridge and some of the outlying islands. No one would ever recommend a swim in the bay, and if they do, never listen to them. You are likely to get some type of infection. On the other side of the shopping complex is Fuji TV. It is a well known building, and you can’t miss it. You can see it from almost everywhere in Odaiba. The distinctly grey building with a large silver ball in the centre makes it very unique. Inside, there are various activities and on weekends and holidays, there may be some amusement like activities in the parking lot in front of the station. Like many television stations in Japan, most of the shops cater to their current line-up of shows, so unless you like Japanese TV, or some of the anime that Fuji TV produces, you won’t find too much to see or do in the area. 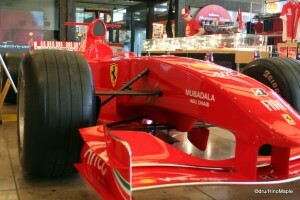 However, if you walk towards Odaiba-Kaihin-Koen Station, there is a small Shell Museum that has a replica of a Ferrari F1 car and other various F1 goods. The last thing to see in the Northern area of Odaiba is Shiokaze Park. While it isn’t necessary to see, it has a nice area for barbecuing and more views of Tokyo. If you head south or further along the Yurikamome line, you’ll reach an area that has many museums and activities. First is the Maritime Museum. It’s hard to miss, so just look for the large ships that straddle the western waterfront. There are two ships moored next to the main building, but if you are expecting anything out of the ordinary, you might be let down. From the website, it appears to be nothing more than a display of various aspects of Japan’s maritime history. If you are a boat nut, go for it, otherwise, you might be better off going to the other attractions. If you have kids, or you are a big kid yourself, you might be more interested in the National Museum of Emerging Science and Innovation. This building might be a little difficult to notice, but there is a large glass wall and inside you’ll see a large electronic globe featuring the earth, moon, and other celestial objects. It is a typical science museum with a planetarium and other various interactive exhibits. Next door is the Telecom Center which is easy to skip, but I heard there is a nice observation deck in the area. If you are looking to relax, the Oedo Onsen is very famous and located in the same area as the Telecom Center. If you are unable to make it out to Hakone, Izu, or other onsen areas, this is the next best thing. You can enjoy the baths for a reasonable fee, and they have a famous foot bath with small fish that eat the dead skin off your feet. Overall, there is pretty much something for everyone in the south-west area of Odaiba. This is Part I of a II part series. Please continue to Part II to finish this series. This entry was posted in Tokyo and tagged Aqua City, Daiba, Decks, Decks Tokyo, entertainment, Fuji TV, Hakone, Izu, japan, Joyopolis, Joypolis, mall, Maritime Museum, Museum of Maritime Science, National Museum of Emerging Science and Innovation, Odaiba, Odaiba Kaihin Koen, Odaiba Kaihin Park, Oedo Onsen, onsen, Rainbow Bridge, Rinkai Line, Shiokaze Park, shopping, Statue of Liberty, Telcom Center, Telecom Centre, tokyo, Tokyo beach, Tokyo-to, Toyota, Yurikamome, Yurikamome Line, お台場, ふじテレ, ゆりかもめ, ゆりかもめ線, トヨタ, フジテレ, 台場, 大江戸温泉, 富士テレ, 日本, 東京, 東京都, 温泉 by Dru. Bookmark the permalink.